2017 promises to be an exciting year on many fronts for local government and most importantly for the residents of Midland. We have a Council committed to change and largely elected on a platform to ‘make a difference’, specifically about spending and taxes, citizen-friendly policy and driving economic development. Council’s preparedness to challenge the status quo, coupled with new leadership and experience at the senior staff level at Town Hall gives many residents hope and belief that 2017 will be a defining year for Midland. As we see it, embracing positive change and pursuing great leadership in a fluid and troubled economic environment is a very good thing. Last week, on December 29th, Ian Burns of the Mirror wrote, “OPP Costing for Midland will take place in 2017”. The article goes on to say that, “in 2015, policing costs represented 27.5% of the municipal budget, up from 18% just 5 years ago”. 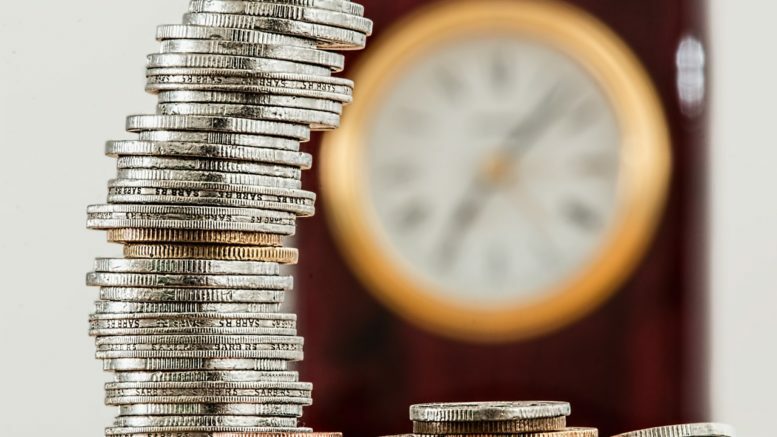 Burns states, “the Midland Police Service recently signed a contract that will increase salaries for first-class constables by 7.2% in 2017.” While there may be a lot of numbers to digest, the bottom line is an OPP costing proposal should help us all clearly understand the value for money equation for police services in Midland. Policing is an essential service that is important to our Town as it is to every community. Considering a bid from the OPP is a question of service levels and affordability. It is not a question of tradition or local pride or whether or not the Chief is a ‘great guy’. Still we will likely hear this kind of stuff trotted out in the months ahead, in many cases by those who have a direct financial interest in the outcome. Most people will recognize that despite different uniforms and paint jobs on patrol cars, OPP and Midland Police officers have identical training and qualifications and both organizations do a very professional, capable job. Most people will agree we should not be afraid to consider the OPP as a policing alternative since they have lived and worked in this area alongside Midland’s finest for decades. And when the OPP successfully bids for policing in a city or town, most uniform officers are just directly transferred from the town police force to the OPP thus avoiding any loss of local knowledge and experience on the streets. So if it’s not about the style of the uniform or the paint on the cruiser, or the qualifications and local knowledge of patrol officers then the discussion and subsequent decision quickly becomes a question of cost for comparable levels of service. The attached chart shows police cost data contained in Financial Information Reports (FIRs) that are filed with the Province by every municipality in Ontario. These FIRs are publicly available on the Ontario Government website. Fact: Midland police costs in 2015 ranked 2nd highest to Barrie in ‘cost per household’ when comparing all municipalities in Simcoe County. 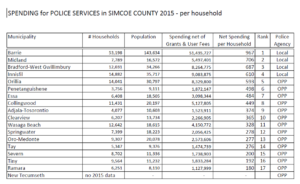 Fact: Our neighbour Penetanguishene spends $498 per household on policing compared to $706 per household in Midland. Fact: Midland has experienced very low growth requiring current taxpayers to shoulder the spiralling costs of policing with very little help from new growth. Fact: The Midland Police Service did bid to expand its service to Penetanguishene several years ago but Penetanguishene could not see the value of doing so. Midland Council takes public safety seriously and has wisely decided to hire a consultant experienced in analyzing OPP bids and local police costs to ensure that all cost and quality comparisons are reliable apples-to-apples comparisons. The OPP bid document is expected sometime this month. That will be followed by the consultant’s objective analysis based not on fiction and fear but only on FACTS. Happy New Year Midland and be sure to get the FACTS! Be the first to comment on "Happy New Year Midland"